"This job can be demanding at times but it's all worth while when you get to see those patients go home to their families"
What should I know about French bulldogs if I'm considering getting one? Doctor Sam is amazing with all our animals, and we wouldn't take them to see anyone else! Even when our little ones are off for surgery, they still look happy! Dr Sam is loved by all our animals and there's a few! 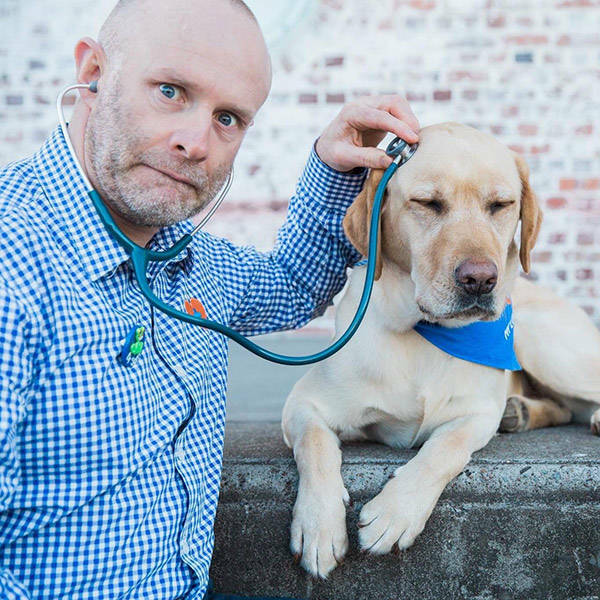 He's super caring and goes above and beyond to research treatment options and coordinate the best care for our furry friends. Nothing is too much trouble for this super vet! That's true! I have always tried to practice conscientious vet medicine. Of course I don't always know the answer but I'll do my best to find out! Dr Jones saved my life. My mum knows him from school and he helped me when I was found dying in a car park from starvation and abuse. We live in Qatar, but Dr Jones messaged mum about what I needed. Thanks Dr. Jones, please vote for Sam Jones! #internetvet. I believe he is my first Qataris patient! Stoked he's doing so well! I'd watch the show if this bet were the star. Thanks Dr Sam for looking after me today! We will be back to visit soon! Dr Sam.....what can I say. Not only is he better looking than Dr Chris, he is the most charismatic man I have ever met in my life. There is simply no other choice for Australia's next Bondi Vet. Couldn't recommend him more. Go you legend! This makes me want to go to the gym. Thanks Andrew!